Al Hoceima (in the Berber language: Eřḥusima or Elḥusima, Taɣzut, Taghzut and also Tijdit, in Arabic: الحسيمة, in Spanish: Alhucemas) is a city in the north of Morocco, on the northern edge of the Rif Mountains and on the Mediterranean coast. It is the capital city of the Al Hoceima Province. It is situated in the territory of the Ait Waryagher and Ibeqquyen tribes of the Rif region, who speak a Riffian variety of the Berber language locally called Tmaziɣt (Tmazight). The city is a known tourists' destination despite its small size. It has a population of about 60,000 to 90,000. The inhabitants of the city speak Berber (Tarifit). Villa, Pearl Of The Mediterranean. Al Hoceima is cited among the cleanest and safest Moroccan cities. It is characterized by its astonishing sandy and shingly beaches like Cala Iris, Bades, Torres, Quemado and Tala Yussef, and its mountainous rocky areas. Parts of Al Hoceima are currently being integrated into the municipality through the construction of new roads to ease transportation and new faculties are being built to better educational systems in the city. The name Al Hoceima is paradoxically an arabization of what was already an Arabic derived word introduced by the Spaniards since it comes from a Spanish word (Alhucemas – literally meaning "Lavenders") which is itself Andalusi in Arabic origin (Al Khazama). After independence, the Moroccan government established an Arabized name for Alhucemas coming up with Al Hoceima, following standard French spelling. The Spanish started to develop Al Hoceima around 1925. General Sanjurjo landed with his troops on the beach of Al Hoceima during the Rif Rebellion and claimed the territory for Spain. He named the territory Villa Sanjurjo, after himself. Many locals still refer to the city as "Villa". The Spanish troops built houses, schools and hospitals above the beach, creating the beginnings of the town. In the 1920s and 1930s, the town had almost no growth in population. Its name changed from Villa Sanjurjo to Villa Alhucemas, and the few streets above the beach were still occupied mainly by Spanish soldiers and their families. The first mayor was Florian Gómez Aroca. After Morocco gained its independence in 1955, Al Hoceima developed quickly, and the Moroccan government changed its name from the Spanish Villa Alhucemas to Al Hoceima, a surprising Arabization of a Spanish word of Arabic origin. (Alhucema originally comes from the Arabic word Huzama). The years from 1956 to 1959 were dark years for the Riffians, mainly for the people in Al Hoceima and Nador. Morocco's Hassan II became the military-commander and under his ruling a large number of people were killed in the Rif in the years 1956 to 1959. In the early 1950s and 1960s, when many of the city's inhabitants were poor, the small houses were all painted white and blue. These colors, representing the sea and sky, were considered the city's official colors. Later, when there was financial growth, people began painting their houses in other colors. The town and surrounding villages were hit by two large earthquakes within ten years. The first (Mw 6.0 event occurred on May 26, 1994 and the second event (Mw  6.4) occurred on February 24, 2004, killing more than 560 people (see 2004 Morocco earthquake). In 2007, Al Hoceima's mayor stated that all new houses would be painted white and blue in an effort to restore the city's traditional appearance. Al Hoceima is now a moderate-size city with a population of 90,000 recorded in the 2014 Moroccan census. It has the second-largest port of the Rif Region (Nador being the largest). The first schools built by the Spanish colonials, (a college and an elementary school) and a Spanish catholic church, still exist today. Playa Quemado, where General Sanjurjo and his troops landed in 1925, is Al Hoceima's most popular beach. It is located just below the luxurious Mohammed V hotel, which includes a tennis court, restaurant, cocktail bar and nightclub. On October 28, 2016, a fish-seller, Mouhcine Fikri, was crushed to death in a garbage truck while trying to retrieve fish confiscated by the authorities, which led to large anti-government protests in November 2016 known as Hirak Rif. Protests continued into 2017, spreading to other parts of northern Morocco and the country. The city's income is based on fishing and tourism. Many of its former inhabitants migrated to Europe during the 1960s through 1980s; large numbers of Moroccans in the Netherlands, France and Belgium were Al Hoceima natives. Many return to Al Hoceima during the summer, stimulating its economy and encouraging investment. Since the 1990s, many western-oriented businesses have opened in Al Hoceima, including pizza parlors, fast food restaurants and clothing stores. The city is served by the Cherif Al Idrissi Airport. There is a Spanish international school, Instituto Español Melchor de Jovellanos. ^ a b "POPULATION LÉGALE DES RÉGIONS, PROVINCES, PRÉFECTURES, MUNICIPALITÉS, ARRONDISSEMENTS ET COMMUNES DU ROYAUME D'APRÈS LES RÉSULTATS DU RGPH 2014" (in Arabic and French). High Commission for Planning, Morocco. 8 April 2015. Retrieved 29 September 2017. ^ a b "Morocco's unrest is worsening". The Economist. 6 July 2017. Retrieved 8 July 2017. ^ "Morocco arrests 11 over fish-seller's death in Al-Hoceima". BBC. November 1, 2016. Retrieved November 3, 2016. 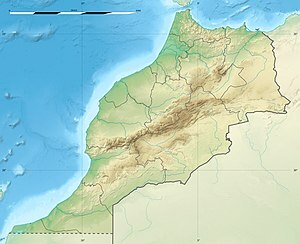 Wikimedia Commons has media related to Al Hoceima.